today MissKait is doing something different.....a GIVEAWAY. yes, you read that correctly. the lovely ladies at Subtle Luxury so kindly gifted me with a beautiful knit wrap scarf...and it could be yours! Subtle Luxury is a California company that offers a plethora of totally gorgeous women's clothing and scarves. like everything on their site makes you want to roll around in a field of cashmere goodness (we all wish, right?) i couldn't agree more when they say, "Comfort is always in fashion." 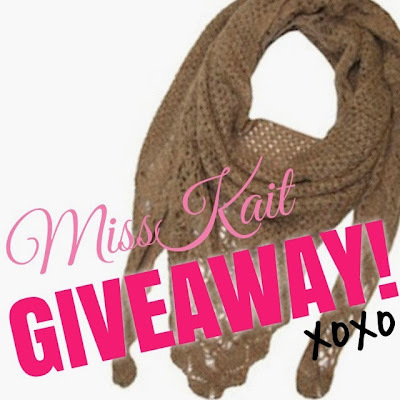 One lucky winner will get the adorable Triangle Open Weave scarf, in taupe. To enter: Comment on this post saying how you would wear it and please leave your email address! Winner will be contacted by email! Love this scarf! I would wear with a pair of dark denim skinny jeans and brown boots with a dark brown long sleeve fitted shirt. I would wear my hair up & throw on a few cream colored bangles. It would look great with my new purple ankle length dress and black belt!!! Oh I love this.... and your blog!! So many great ideas :) If I won I would pair this with a cream tee, my leopard cardigan, dark wash skinnies and tan riding boots! .... my email is eringuy3@gmail.com THANKS! How do you wear this scarf as pictured? I just received it and can't figure out how to wear it that way. Do you have to cut the threads holding it together? Many thanks! i find your hair style very nice and fashion,your clothe,too.pretty chic style!! !